About 10 years ago, a woman I know gave up a high paying job in Connecticut because she felt she could not handle the stress. She moved to rural Florida for a few years, lived with a guy she had met in high school in a house that her parents bought, and basically became substantially unemployable – not that she was looking for a real job. She held various low-level jobs until the economy started to slump. Over the course of the past decade, she has broken off her relationship with her high school “friend” and grown increasingly dependent on her now 70-year-old parents. They started by paying for her home and then her health insurance. Finally, about six months ago, the parents sold the house and had their daughter move in with them. They now cover all of her insurance and living expenses, while she works to earn just enough money to go out with her friends. The parents are not made of money. Indeed, the recent economic slump has made money a bit tight for them, as their investments have shrunk. Still, they do not stop paying for their daughter’s needs and many of her wants. (It is only recently that she gave up a $500 per month lease on a luxury car!) They even co-signed a loan for the daughter’s ex-boyfriend’s truck but, fortunately for them, he paid off the truck on his own. When Did Children Stop Taking Care of Elderly Parents? If we look back at history, the idea of elderly parents taking care of the financial needs of adult children is quite new. Until quite recently, just the opposite was true, and parents could hope for at least a modicum of support from grown children when the parents reached a certain age. Now, it seems that the number of adult children who are relying on parental support is growing by leaps and bounds. Parents should not have to support adult children who are not disabled. 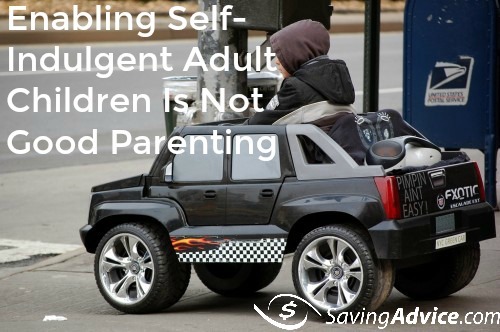 Enabling self-indulgent and selfish behavior in adult children is not even good parenting. An adult who finds a better paying job will enjoy a higher standard of living. An adult who takes a pay cut will need to make sacrifices. Just because an adult wants to take a pay cut, however, should never mean that his or her parents should be the ones to make sacrifices. Given our current economic climate, there is no justification for an adult child to live off of a parent’s largesse. Supporting an adult child is a very bad decision, especially if the parents do not know if they have sufficient funds to support the child for the rest of his or her life as well as themselves for the rest of their own lives. If You Have Children, What Should You Do? If you are a parent supporting an adult child, you cannot show junior to the door without a transition period, of course. Set up a plan so that you can wean your child off of your expense account. Give the child a period of time to find a job, to save some money and then to move out or to start paying their own rent. Offer emotional support and guidance, but cut off the ready flow of funds. Make being a dependant unpleasant, but don’t stop showing your love for the child. Do you have any other advice for caring for adult children? Share it with us in the comments below! Should Parents Pay for Their Children’s College Education?